Opening Ceremonies for Ashland Little League! This Saturday, April 6th at 11:30, I will join the opening day ceremony for the Ashland Little League. The opening day ceremony will honor graduates and prior champions, specifically the 1998-1999 season as it marks 20 years since winning the district championship. This year the season opens with major enhancements to the field — all because of funding from the Marcellus Shale Legacy Fund Grant. My office assisted the Ashland Little League in securing these funds and I am looking forward to celebrating with them on opening day! 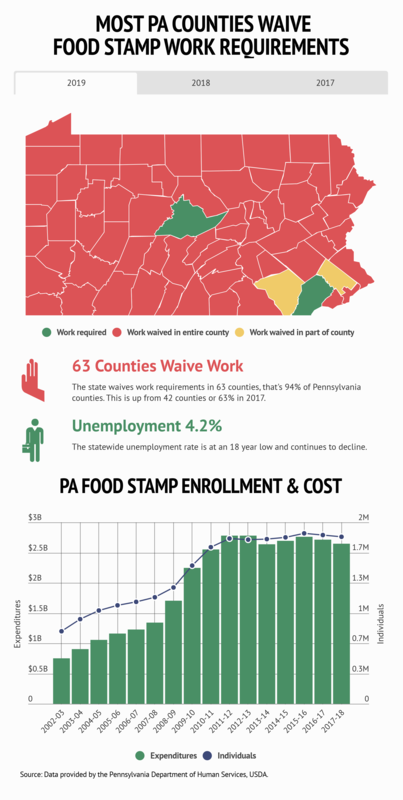 A recent report from the Foundation for Government Accountability showed that work-oriented reforms are helping individuals on SNAP–food stamps– access more opportunities and sustaining paychecks. The state of Florida implemented work requirements in 2016. Since that time, approximately 94% of able-bodied, childless adults have left Florida’s food stamp program. These individuals are employed in over 1,000 industries across the state. Additionally, those who still qualify for the food stamp program are cycling out of it very quickly, with 40% of enrollees being in the program for less than a month. These positive results in Florida are very similar to states such as Kansas, Maine, and Arkansas who have enacted work requirement laws. Approximately 80% of Americans support the idea of implementing work requirements. Although the SNAP program is administered by the federal government, the state can take action to change it. Representative Mike Tobash (Schuykill/Dauphin) has introduced House Bill 435, which prohibits the state from applying for SNAP waivers. For more information, please check out the full Commonwealth Foundation’s article here. The Senate Majority Policy Committee, which I chair, will examine the impact of changing demographics on higher education during a public hearing on April 10 from 9 a.m. to 10:30 a.m. in Room 8 – EB of the East Wing, Capitol Complex in Harrisburg. The committee will hear testimony from Nathan D. Grawe, a Carleton College economic professor who studies higher education through the prisms of demand and demographics. We have 338 colleges, community colleges and trade schools here in Pennsylvania. Some of these institutions are thriving and expanding while others are experiencing financial difficulties and an unpredictable future. If demographic changes significantly reduce the number of average college-aged students, then the struggling institutions must now begin to develop a game plan to ensure that their situations do not become worse. I am looking forward to learning more about the situation during the hearing next week, stay tuned! This week, the Tamaqua Rotary and the Tamaqua Chamber of Commerce invited me to give an update on school property tax elimination. I know many of you are frustrated by the lack of progress regarding this issue. There has never been more special interest opposition to a bill than this one which I introduced on behalf of more than 80 different local taxpayer groups across Pennsylvania. Since it was defeated by the last Lt. Governor’s tie-breaking vote in a prior session, many of you have told me not to give up on this issue. 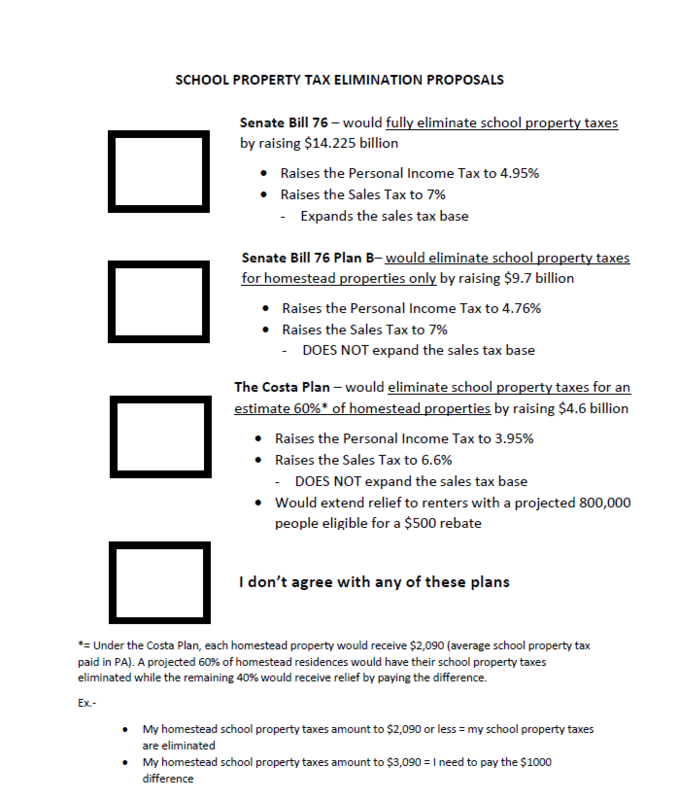 During this event, I handed out ballots explaining different property tax elimination proposals to see where local residents stand on this issue. I will continue to bring these ballots with me to other, similar meetings in the future, across the district. 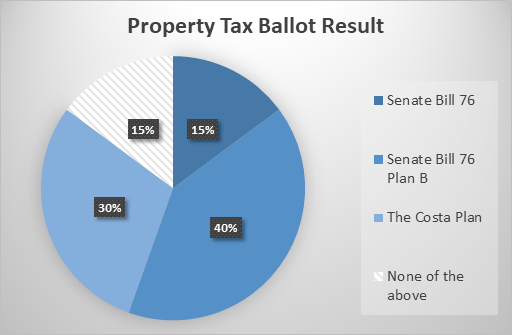 The results are in: 85% of those at the Tamaqua meeting agreed that major reform is necessary–15% preferred Senate Bill 76, 41% preferred Senate Bill 76 Plan B, and 30% preferred the Costa plan; the other 15% of attendees did not agree with any of the plans to eliminate the school property tax. Thank you again to the Tamaqua Rotary and Chamber of Commerce for inviting me to provide an update on the various version of property tax elimination proposals. As noted above, I will continue to look for ways to ask more of you the same questions, through local meetings and through this e-newsletter. Stay tuned! The Pennsylvania Liquor Control Board sponsored its annual Alcohol Awareness Poster Contest. This program challenges students to create a poster encouraging their peers to pursue healthy alternatives to underage drinking. On Wednesday, April 3rd the student artists were honored at a ceremony in the State Museum of Pennsylvania. Please join me in congratulating the winning students from the 29th district: Olive Peluchette, Ella Anne Marous, Alexis Wertz, Trey Crowley, Kyle Groff, Maddy Snyder, and Naomi Vogel. Congratulations! Naomi Vogel. Congratulations! Clearly Clean Products, LLC, a manufacturer of recyclable plastic trays for retail food products, will expand its presence in Schuylkill County. The project, supported through state funding, is expected to create more than 125 jobs in the region. Clearly Clean Products, LLC manufactures 100% recyclable food trays. This company focuses on eco-friendly products and is dedicated to high quality, innovative products that are environmentally friendly and made in America. The Pennsylvania Departments of Agriculture and Community and Economic Development, along with the Center for Dairy Excellence, today announced plans for the second annual Pennsylvania Ice Cream Trail and urged interested creameries to participate. The trail includes an incentive-based passport program that encourages customers to earn a reward for visiting participating creameries. Last year, more than 1,500 passports were redeemed! 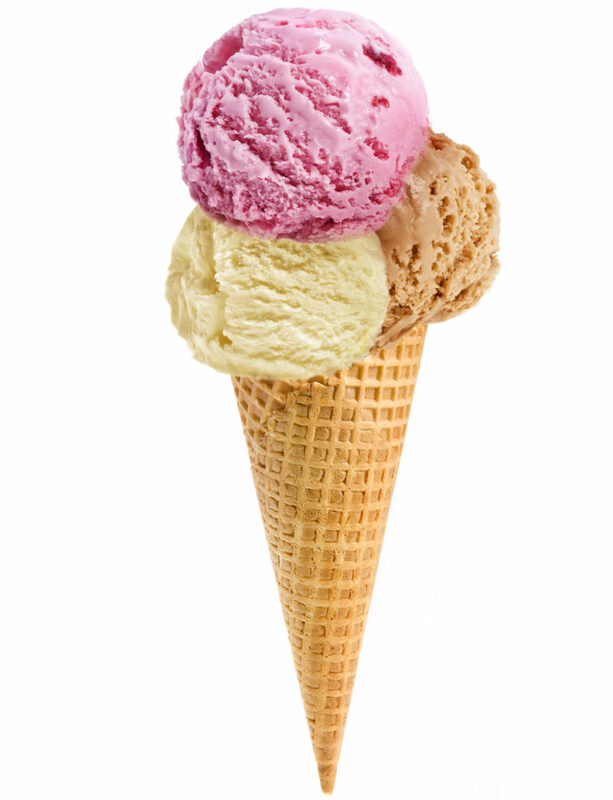 The PA Ice Cream Trail Passport Program is exclusive to PA Preferred farms and creameries. Farms selected will be based on location and product offerings. If you are interested in applying, please contact the Center for Dairy Excellence at 717-346-0849 or via email at info@centerfordairyexcellence.org. Anyone who knows me well knows that I will often be found with an ice cream cone in my hand!